For a few hours each year, Burns Night in Scotland and Australia Day in the Land Down Under coincide. So why not celebrate both at once, with some great Ozzie wines and a traditional Haggis. 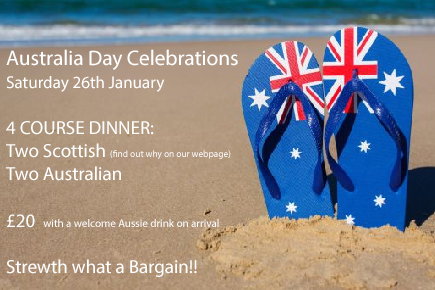 There will be a whole plethora of Aussie wines and Scottish whiskies to buy on the night, either by the glass or bottle. The soundtrack will be mix of Men at Work ‘Down Under’ and the Proclaimers ‘I would Walk 500 Miles’ – not really! !